Health At Every Size® is a model of care that addresses physical and mental wellness for everyone, regardless of body size or current health status. This holistic perspective been around for several decades but the label of “Health at Every Size®” or HAES is newer. According to hundreds of studies, the primary factors that influence the health of Canadians are not medical treatments or lifestyle choices but are the living conditions we experience.1 These conditions are known as the social determinants of health. It is critical that we expand our definitions of health and address all aspects of a person’s life that determine wellness: physical, environmental and psychological. While health is shaped by genetics, early childhood development and a variety of lifestyle factors, it is also shaped by access to food, housing, health care and social services. Education, income level, employment status, and working conditions all contribute significantly to wellbeing. Public health policy recognizes that many of these social determinants of health are not actually within our individual control.2 Yet, people perceived as “overweight” are often subject to stigma and blame for causing their own health problems. HAES is a hopeful and compassionate philosophy that recognizes that many factors impact health. HAES helps people improve their health in part by treating their bodies with kindness and respect. It also provides a treatment framework to help care providers more clearly interpret an individual’s health indicators and more effectively support their needs. It takes the focus off of weight as the primary health determinant and addresses the whole person within the context of their lives. As HAES gains momentum, it has been subject to a number of misperceptions. Media articles and blog posts that claim to be arguing against the principles of HAES are often arguing against the myths that surround it, which only serves to perpetuate those myths. Myth: HAES supporters claim that everyone is healthy regardless of their weight. HAES is often misunderstood to mean an individual can be healthy at any size. In fact, not everyone is as healthy as they can be at their current size. Some people may need to gain weight for optimal health and others might benefit from weighing less but that doesn’t change the fact that there is no known, safe way to achieve long term weight loss for the vast majority of people.4 HAES is about making positive health changes that are sustainable and improve quality of life. Myth: HAES is just a new approach to weight loss. Recently, some diet programs have been using HAES language to promote their programs. They allude to body acceptance and positive life style changes but then tack on that familiar promise of weight loss. All of us have a weight range at which our body is most comfortable and at its most functional. Due to eating disorders, other health conditions, lifestyle factors or medications some people may be above or below the weight range that is healthiest for them. When people change their health-related behaviours or attitudes, they sometimes gain or lose weight as a side effect of these changes; sometimes weight remains the same. HAES practitioners say we are “weight neutral” because improved health is not indicated by the number on the scale. Myth: HAES requires adherence to organic, natural foods. Balanced, pleasurable eating takes into account a person’s individual tastes, cultural norms and personal preferences as well as environmental and ethical beliefs. It may also take in to account food allergies or other requirements based on specific health conditions. There is room for both animal proteins and plant-based proteins as well as traditional foods like bannock or curry and everything else from carrots to ice cream. Start with the knowledge you have now about your own relationship with food and consider how you can improve that relationship through respecting your body’s unique needs and ensuring you have the energy you need to do the things you want to do. Myth: HAES is just another one-size-fits-all idea that won’t work for me. HAES is actually about making changes that are appropriate for each individual and that recognize diverse and unique needs. Someone with binge eating disorder may need to first pursue mental wellness through counselling to learn new coping strategies and skills for eating mindfully. That person may also be improving health through joyful movement and increased social contacts. Someone else who is diagnosed with diabetes may start with appropriate amounts of exercise and more frequent meals to help their body maintain blood sugar balance. Another individual with mobility restrictions may not be able to add in a daily walk but could improve physical health through a chair-based yoga routine and might focus on spiritual wellness in whatever way feels appropriate for them. Myth: HAES is the “I Give Up” plan. HAES encourages letting go of short term weight loss, diet cycling and body dissatisfaction. Respect for the diversity of body sizes and acceptance of one’s own body is an important tenant of HAES. People who experience self-respect are more likely to be kind to themselves and make positive changes to health behaviours. Few of us make lasting positive change in response to shame, social stigma or self-loathing. People frequently give up on diet plans because they are not effective; it’s the diet that failed, not the person. Embracing HAES is a decision to not give up on oneself. HAES provides new ‘indicators’ of health and wellness such as feeling better, having more energy, sleeping better, reducing pain, improving strength, mobility and fitness, and improved moods. Myth: HAES is only relevant to fat people and is not appropriate for someone who is recovering from anorexia. While the HAES principles were initiated within the fat-acceptance movement, it has developed into an excellent health care model for everyone of every body type and size. Many people of so-called “normal” weight, are preoccupied with controlling their weight in the name of health; HAES offers a more peaceful solution. 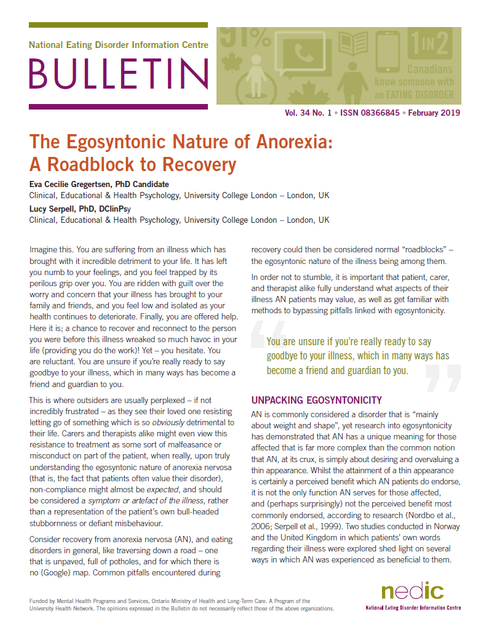 People recovering from anorexia may not be able to utilize an intuitive approach to eating and movement initially because their internal cues of hunger and fullness are not reliable. Treatment usually involves structured meals, significantly increasing nutrition and an eventual connection to, and acceptance of, body cues. Weight gain is not the goal of treatment within a HAES framework, but a positive indicator is increased nutrition and recovering mental health. The Health At Every Size® model of care is appropriate for everyone because it encourages prevention, treatment, healing and recovery through choices that address physical, social, spiritual and emotional health rather than controlling body size. 7. Bacon, L., VanLoan M., Stern, J.S, and Keim, N. (2005) Size acceptance and intuitive eating improve health for obese Female chronic dieters. Journal of American Dietetic Association, 105, pp. 929-936.